Vladimir Putin placed the onus on Petro Poroshenko’s government to follow through on the Minsk agreements to resolve the Ukrainian conflict in comments made at a joint press conference with German Chancellor Angela Merkel in Moscow. “The success of the peace initiative depends on those who hold the reins of power. By this, I mean primarily the government in Kiev. In turn, Russia will try to exercise its influence with the leadership in Donetsk and Lugansk [regions],” the Russian president said. “We believe that Kiev needs to lift the economic blockade of the Donbass region, restore banking services, and carry out a constitutional reform with participation from the southeast of the country,” said Putin, who noted that all of these conditions were contained within the Minsk roadmap, signed by Ukraine, Russia, France and Germany. Putin admitted that there were “issues with compliance with the agreements on both sides,” but noted that systematic violence has decreased in the past three months, and said there was no alternative to the agreed peace plan. Last month, the UN estimated that the total death toll for the conflict, which began a year ago, had exceeded 6,100 people. After a period of calm, violence between the secessionist rebels and the government, neither of which have renounced their territorial claims, has surged. 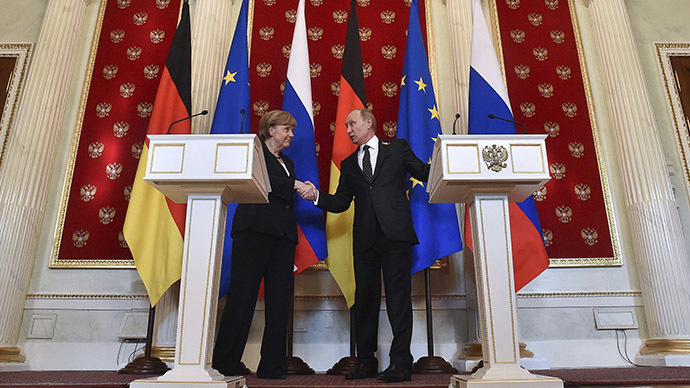 For her part, Merkel said that Putin “wields sufficient power over the separatists to at least ensure a ceasefire,” and called for “the territorial integrity of Ukraine to be restored,” mentioning not only eastern Ukraine, but Crimea, which became a part of Russia in March 2014. Putin also returned to his persistent theme of Western double standards, citing the recent Saudi-led international intervention to restore power to Abd-Rabbu Mansour Hadi, who was toppled by Shiite rebels earlier this year. “There was a coup, the president gave up his powers, and now other countries, with whom we have good relations, are trying to return him to power. This is acknowledged as a coup. After a coup happened in Ukraine last year, we heard a bouquet of insults flung towards the deposed president Viktor Yanukovich, while those who seized power received every sort of encouragement,” said Putin, answering a question from the media. “If we are going to approach similar events from such contrasting viewpoints, then we are never going to find common ground. In the international arena, it can’t always be that ‘might is right,’ but norms of international law, which are understood, applied and protected in the same way by all the participants,” said Putin, who called for the UN, and not blocs such as NATO, to become the arbitrator of international conflicts. Thanking Merkel, who was the only leader of a major Western power to visit Moscow for the commemoration ceremonies marking the victory over Nazi Germany, Putin admitted that there had been “difficulties” between the two countries over “competing perceptions of the events in Ukraine,” resulting in a “cooldown,” but said that he had hopes that the situation would improve in the near future. “Our countries cooperated even in much more challenging conditions, when there seemed to be insurmountable barriers,” said Putin.